Spectacular fall colors are common with the most native red maple trees, but this hardy Canadian introduction with its incredible orange-red autumn display is possibly the brightest of them all. The medium-dark green leaves actually start turning in early September! A large tree, it could grow 50 ft. tall at 12" per year with a broad, oval shaped head. 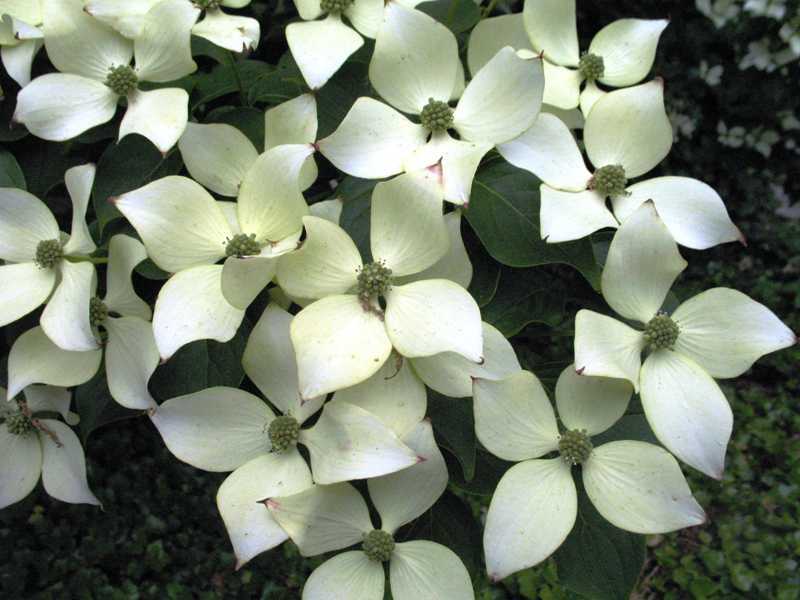 It is tolerant of sun or part shade and thrives on most soil conditions. 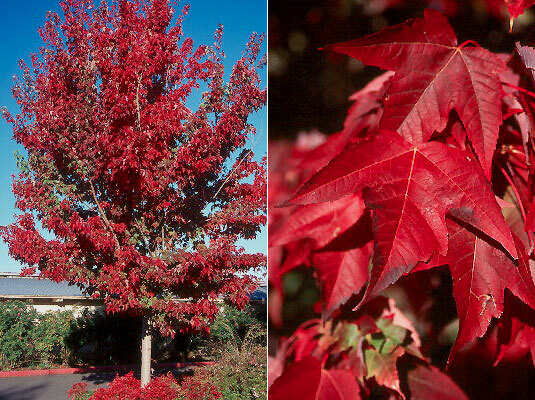 Gorgeous, brilliant reddish orange foliage create a 'fantasy' of fall color on this cross between urban tolerant Silver Maple and the colourful Red Maple. 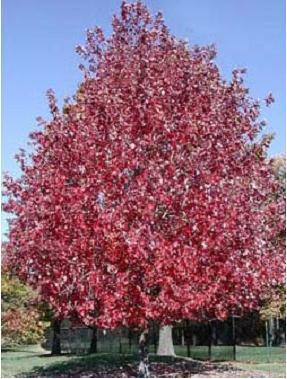 A relative to the popular 'Autumn Blaze', this oval-shaped shade tree grows about a foot per year to 40-50 ft. tall in sun. An excellent selection for homeowners, it is tolerant of both moist and dry conditions. 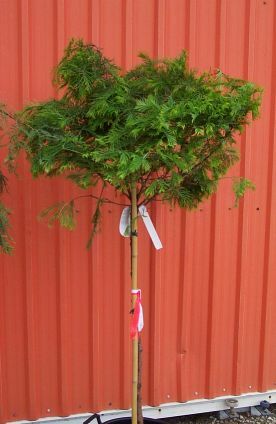 This very new tree is perfect for smaller spaces becaue it has an extremely tight, upright canopy, a vigorous deep root system, and a great show of colourful leaves all season long. 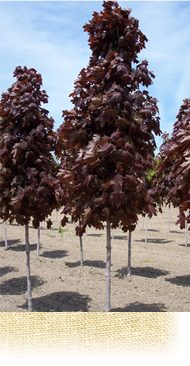 The new foliage buds to a rich, burgundy-red leaf with a deep wine-red underside. The new growth through the summer maintains this burgundy colour, while the interior foliage matures to deep green as the season progresses. Fall frosts result in a colour show of bright red and orange in the fall. It is tolerant of most soil conditions except very wet, and best of all, it needs no trimming or pruning to maintain its columnar habit. Bold spikes of dark pink and yellow flowers cover this small hybrid tree in spring. It is Ideal for the smaller home landscape, it bears light green palm-shaped foliage in spring, which deepens in summer before turning yellow in the fall. Flowers form typical horsechestnuts in fall which provide food for squirrels and other wildlife through the winter. It grows slowly to 35 to 40 ft. tall and wide in sun or part shade and it is highly tolerant of city conditions. This smaller tree grows to 15-20 ft. tall and wide in full sun, and is best known for its heavy show of long lasting large white star shaped blossoms in early June. It also has lovely 'peeling', strong scarlet fall colour and berry-like fruit that the birds absolutely love! Although it grows somewhat upright when it is young, distinct horizontal layers of branches become more striking as the tree matures. People will notice this curious focal point! 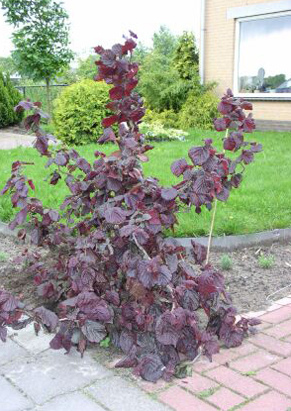 Now grafted on an ornamental stem (shrub form shown), this 'Purple Hazel and Contorted Hazel' cross bears wrinkled burgundy-red leaves in spring that turn reddish green in summer and then finally orange/maroon. Red fall catkins and the twisted branches add interest into the winter. A durable plant for most soil and exposure locations, it does best in moist, well-drained soil and it tolerates sun or part shade. In the springtime, the 3-4 ft. diameter head of this dwarf tree forms coral pink buds that burst into long lasting fragrant double rose flowers. Dense green leaves and tiny red cherry-sized fruit follow. Fruit is quite small and should not be considered 'messy'. 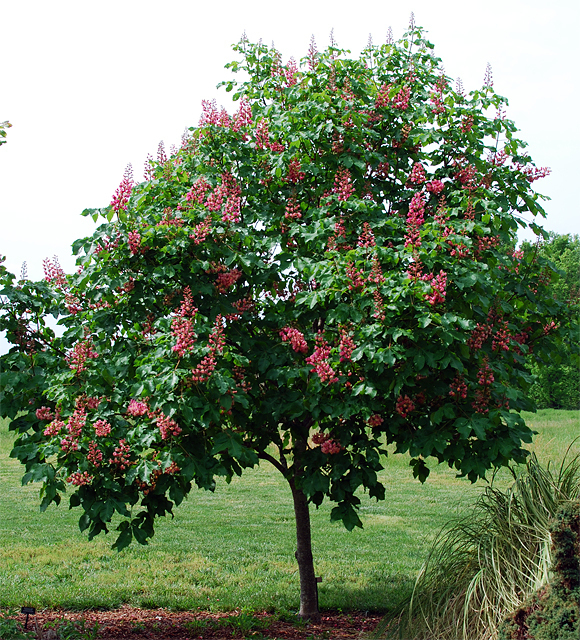 A very hardy tree that grows in almost any sunny spot, it can grow 5 to 7 ft. tall and is and ideal feature tree in a small yard or garden. What's a Dawn Redwood? Dawn redwoods are long lived trees that are cousins to the famous California redwoods. Having some similarities to tamarack larch, dawn redwoods have soft needle like leaves in season that turn orange to yellow tan in fall. This rare dawn redwood is a true dwarf, growing slowly in a compact globular form to a height of 8 feet, but can also be trimmed to suit. Orangey bark is a winter feature of this plant. An unusual plant that is 'not the same old same old'. ** Available by special order. 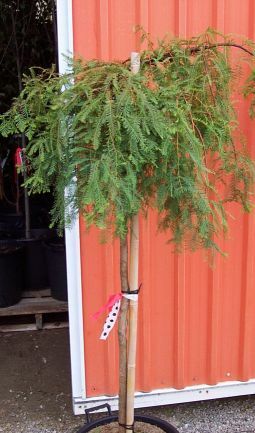 Similar to dawn redwoods like Matthaie Broom (above) this rare weeping dawn redwood has feathery blue green foliage that turns golden tan to brown in fall before dropping. It grows slowly to approximately 8 feet tall in sun or light shade. It's interesting foliage and fine texture make it a deceivingly hardy feature plant in a garden bed or near an entry. It grows in most soil conditions except for very wet. **Available by special order. 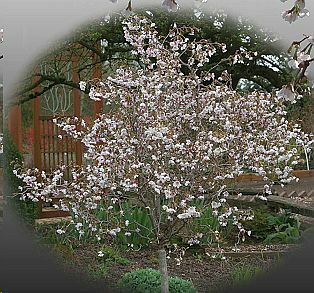 Seldom do we find a tree that has such an unusually beautiful character as this broadly vase-shaped Kwanzan Cherry. Fragrant double shell pink flowers are an absolutely spectacular sight against the wine-red leaves. 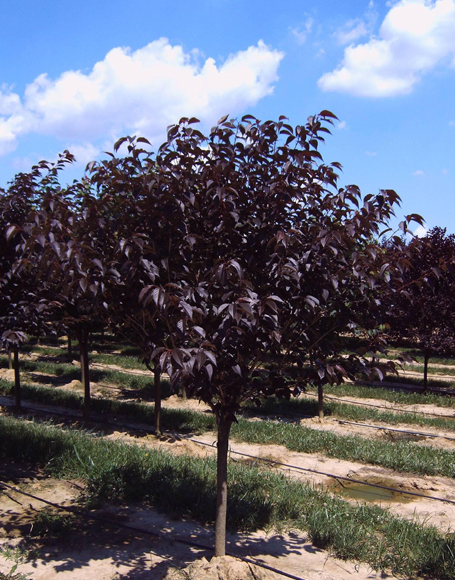 A brand new introduction, this tree grow only 20 ft. tall by 12 ft. wide in full sun and is more tolerant of heavier clay soils than most cherries. Absolutely stunning when in full bloom! 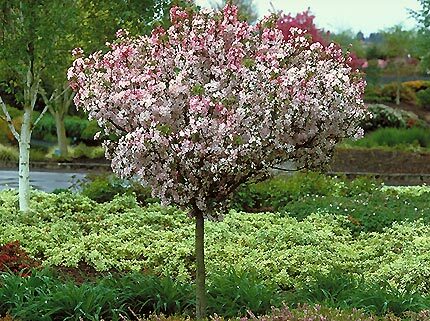 A recent award winning introduction, this quite unusual, slow-growing Japanese cherry like ornamental tree has unique branches that zigzag all over the place! In the springtime, clusters of white flowers with pink centers are plastered on every inch of available wood followed by green leaves that turn a strong maroon to red in the fall. Perfect for small spaces, its 'head' grows only 5-6 ft. tall and wide in a sunny or partially shady garden. This large and fast growing tree has striking bark that peels to reveal a lighter colored bark underneath. Bloodgood is one of the best varieties of this plant for its disease resistance. It is a large, rounded tree growing to 60' tall with deep green leaves that turn a poor yellow in fall. The plant tolerates poor cultural conditions, including heat/drought and poor soil, but should be planted where there is ample room for it to grow. 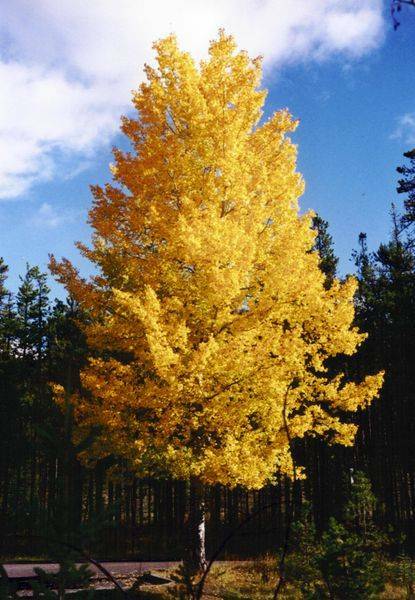 Trembling Aspen grows throughout North America largely because it has a great capacity to grow on many soil types, especially sandy and gravelly slopes, and it is quick to pioneer disturbed sites where there is nothing but bare soil. This fast-growing tree has glossy green leaves, smooth and almost white birch like bark, and pretty golden yellow fall colour. The unique rustling sound the tree makes is due to the specific structure of the leaf stem. 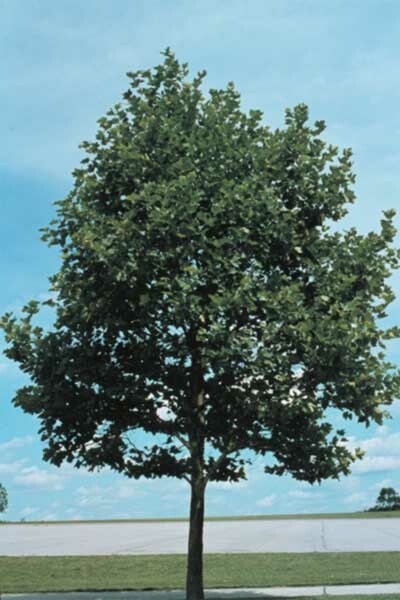 A large tree, it grows easily to 50' tall. **Available by special order.